March 25, 2015. New York Sea Grant, with an extension office at SUNY Oswego, has received funding from the National Oceanic and Atmospheric Administration through the National Sea Grant College Program to track historic storm events along the eastern shore of Lake Ontario. The project will create a climatological event database to better assist risk projection to help communities increase their storm event resiliency. "This project will create a well-documented Great Lakes climatology resource that will serve as a benchmarking resource for eastern Lake Ontario shore communities similar to risk projection tools already available to East Coast stakeholders facing storms that impact the Atlantic coastline," says New York Sea Grant Associate Director Katherine Bunting-Howarth, based at Cornell University, Ithaca, NY. New York Sea Grant is recognized as a leader in developing coastal storm awareness resources for the marine district of New York State. 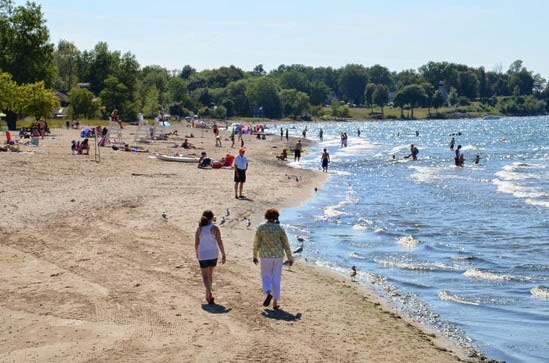 Specific focus areas for this pilot project will be the fragile dunes areas along Lake Ontario in Oswego and Jefferson counties and the Sodus Bay area with a 7,500-foot-long barrier beach in Wayne County. The project will develop a monitoring program to track storm impacts, such as erosion and structure damage, and will revive periodic photo monitoring of the dunes areas to show changes over time. In the past, New York Sea Grant photo monitoring of the 17-mile Eastern Lake Ontario Dune and Wetland Area has shown the success of beachgrass restoration plantings that help stabilize the sand dunes. The historical retrospective on Great Lakes storms will include review of stakeholder reports, maps and meteorological data on historic storm damage going back to 1950. The project leaders are New York Sea Grant Coastal Community Development Specialist Mary Austerman and New York Sea Grant Coastal Recreation and Tourism Specialist Dave White. They can be reached at 315-312-3042; the New York Sea Grant office at SUNY Oswego is located in Penfield Hall. For updates on New York Sea Grant activities, www.nyseagrant.org has RSS, Facebook, Twitter and YouTube links. New York Sea Grant (NYSG) is a cooperative program of Cornell University and the State University of New York is one of 33 university-based programs under the National Sea Grant College Program (NSGCP) of the National Oceanic and Atmospheric Administration (NOAA). Through its statewide network of integrated services, NYSG has been promoting coastal vitality, environmental sustainability, and citizen awareness about the State’s marine and Great Lakes resources since 1971. In January 2014, New York Sea Grant, Connecticut Sea Grant and New Jersey Sea Grant awarded $1.4 million in funding to 10 social science research projects to improve community understanding and response to coastal storm hazard information as part of the NOAA Sea Grant Coastal Storm Awareness Program. 1 Comment to "Sodus Bay Part of NY Sea Grant "Tracking Great Lakes Nor'easters" project"